Even the most seasoned homeowners feel a little nervous when taking on home remodeling projects; it’s normal. Renewal by Andersen of St. Louis believes in the saying, “Expect the best, prepare for the worst,” which is why we’ve prepared a quick guide about what to expect in a window replacement project. Contingency funds – We st and by the prices stated in our written quotations. But as with every remodeling project, there are small, sometimes unexpected expenses that could involve anything from buying snacks to emergency repairs. it’s better to be on the safe side and have contingency funds ready. 20% of the contract price is a reasonable ceiling amount. It will be noisy – All home improvement projects tend to be noisy, window replacements included. If you’re expecting to do anything where noise would be intrusive, such as working at home, looking after an infant, or needing to sleep during the day, make arrangements as early as possible: book a shared office space for the day, take the day off work, or have a relative take care of the baby for the day. You may also inform your next-door neighbors as a courtesy, especially if the houses themselves are only a few yards apart. There will be dust – Expect dust and debris as we install the new windows and remove the old ones, so you may want to buy dust masks beforeh and. We take every precaution to keep everything clean with every window we install: we place drop cloths around the work areas, use protective footwear to prevent tracking dirt into the house, and thoroughly clean up after ourselves. In fact, more than a few clients have remarked that the new windows looked like they magically installed themselves. Foot traffic – Our installation team has to work on both sides of your window opening, so you should expect a considerable amount foot traffic during installation. Our team will help you with clearing the work areas and carefully move your furniture and valuables out of the way. In addition to the aforementioned footwear, the work areas will be clearly marked, covered, and protected. 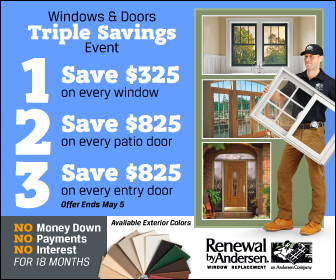 For the most worry-free replacement windows and patio doors, call Renewal by Andersen of St. Louis. We serve residents of St Louis, MO and surrounding areas. To schedule a free in-home consultation with our expert consultants, call us today at (314) 332-2364 or fill out our contact form.